The Eighteenth Judicial District Commission on Judicial Performance unanimously recommends that Judge Michelle Ann Amico BE RETAINED. 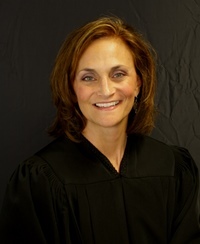 Judge Amico was appointed to the district court bench in 2012. She earned a bachelor’s degree from the University of Arizona in 1989 and a J.D. from the University of Denver Sturm College of Law in 1993. Prior to her appointment to the bench, Judge Amico served as the Chief Deputy District Attorney in Denver, where she acted as a prosecutor and directed the Family Violence Unit, County Court Division, District Court, Juvenile Division and Gang Unit and intake Division. Judge Amico believes strongly in community service. She substitute teaches criminal law and procedure on occasion at the University of Denver College of Law, and also teaches Continuing Legal Education classes for the Colorado Bar Association. In 2014, she taught an evidence practicum for the Family Law Bar and appeared in a panel discussion of gender-based violence in the legal system. She has judged regional high school mock trial competitions for the last two years and mentors an average of three interns each semester. She has volunteered with the Race for the Cure for the last three years, with the Littleton Public Schools for the past two years, and with Catholic Charities for more than 15 years. Judge Amico is relatively new to the bench, and although she comes from a strong background in criminal law, she has made the transition well to hearing domestic cases. The Commission sees Judge Amico as a strong judge who is dedicated to learning and whose performance will only improve over time. It is anticipated that she will continue to learn and grow when she takes over a mixed docket of both criminal and civil law in July of this year.